GEORGETOWN RUNNING CLUB: Kliminator at Cherry Blossom? Found this on the Pacers website. I believe it was from Cherry Blossom last year, you can see Klim's nemesis lingering behind waiting to unleash his menacing mid-distance guy speed. Brian Baillie (#229) ran at Haverford, same college Jason Dwyer attended. 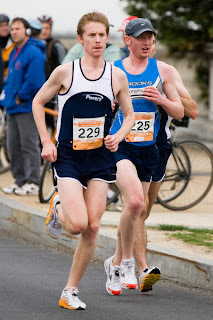 Bert Rodriguez (pictured behind Kliminator), who attended the Naval Academy, and Baillie both run for Pacers. May be Luke Merkel's bike in the background, I think the Kliminator PR'ed in the 10 mile that day. Yes, that's def Cherry Blossom. Must have been around 4 miles...I was in a PACER sandwich.